I started driving almost 40 years ago, and I can honestly say that I am no better at driving today than I was when I first received my license at the tender age of 15. It’s not that I haven’t gotten my reps in. When I was a home health physical therapist, making house calls over 3 different counties, there were times that I logged over 50,000 miles in a year. Yet I’m still not a good driver. How is that possible? The answer reminds me of a lesson I received from Dr. Eugene Styles, in one of my education classes back at the Citadel around 1985. He said, “There’s a big difference between having 20 years of experience and having one year of experience 20 times.” It’s so true. You can’t just bang out 10,000 hours of mindless training reps and expect to achieve greatness. That practice must be purposeful… and variable. As I stated in an earlier blog called “Any Moron Can Make You Sore”, the body must be panicked into adaptation. In the dynamic systems theory, an organism is not interested in a stimulus it considers familiar or mundane. To elicit any reaction or adaptation, all non-reflexive stimuli must clear the Reticular Activating System (RAS). The RAS is a small collection of neurons in the brain that serves as the initial filter for all sensory information. The RAS is sort of an “On” button for the brain. One branch of the RAS is responsible for arousal levels and sleep-wake transitions and a second branch manages a phenomenon known as habituation, in which the brain learns to ignore repetitive, meaningless stimuli, while remaining reactive to stimuli it views as new or different. Training monotony, doing the same thing over and over again, can induce habituation. The RAS is located anatomically in a place where your thoughts, internal feelings and outside influences converge. Therefore it is affected my both internal and external stimuli. Motivation or RAS excitation can come from a top-down central nervous system approach or from a decentralized, peripheral, bottom-up process. Stimulating music, verbal encouragement, and emotional boosting of myelination are all strategies to alert the RAS and facilitate learning through the central nervous system. This is why we allow our students to train with headphones blaring their favorite music, our instructors consistently offer verbal motivation, and our athletes are encouraged to freely and vigorously express positive emotion in response to favorable results during their drills and exercises. Decentralized, bottom-up stimuli can also open the door to the RAS. As stated earlier, the system will not respond well to activities or events it views as routine or monotonous. If you keep hammering out the same exercises and drills day after day, week after week, your RAS will eventually habituate or accommodate to the stimulus and the drills or exercises you perform will no longer manifest a training effect. Your performance will plateau and you may experience significant frustration and/or burnout. This is why differential learning is so important. By throwing varied weighted balls, long tossing at varying distances, launching from different surfaces and/or random body positions, we force the RAS to stay vigilant and we avoid habituation. The variability adds load to our training process and elicits the required adaptation. 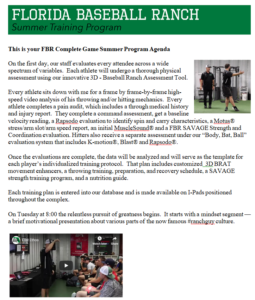 In addition to alerting the RAS, we must also ensure that every facet of our training process — from our throwing drills to our mobility exercises, to our power building workouts and our strengthening exercises — is laced with clear goals and intent. It’s a motor learning precept known as the intention-action model. In this highly researched and widely supported model, when we generate movements, the muscles we use are not selected in advance. Instead the specific muscles and sequences are chosen at the last moment. This allows the amount of adjustability necessary to perform tasks such as high level throwing and/or hitting that require reaction to an ever-changing environment. But, if training movements don’t have a clear intention, they may operate on autopilot, choosing less efficient or preformatted pathways/strategies to complete the task. This type of training is not likely to transfer to improved performance in actual competition because it will not elicit adaptations in coordination and/or adjustability required for game-intensity execution. 2) You may not be able to summate kinetic forces through your entire movement, which could cause you to leak velocity. 3) If your body or your arm begins to wander toward the outer limits of connective tissue safety, you will not be able to subconsciously make the corrections necessary to avoid injury. This is why it is imperative that you execute all practice drills/throws with systematically randomized variability and game level intent. Doing so will help you throw harder and improve your command. The adjustability you create will act like Kevlar for your arm, and you’ll likely to experience injury. One of the major problems with traditional strength training is that nearly all the exercises performed lack clear intention. This can represent a form of training corruption. If your movements in the gym consist of mindlessly lifting a weight through a range of motion, without a clear target, your training is like to corrupt your development. The strength gains you acquire in non-intentional movements may not transfer to improved on field performance. In physical therapy practices, it’s not uncommon – especially in immediate post-operative situations – for therapists to apply electrical stimulation in an effort to produce strength gains. They call it “Russian Stim” and except for fact that the stimulation excites and opens the arteries, and the pumping action of the muscles might assist lymphatic uptake of cellular debris, this practice is of no value. There are no studies that have shown actual histological changes in muscle structure or increased muscular strength as a result of external or artificial stimulation. Inducing muscle contraction artificially ignores the neurologic and motor control components of strength training and exercise. Strength gains don’t come from simply contracting a muscle over and over again. True functional, contextual strength gains require a coordinated symphony of neuromuscular activity involving agonists (muscles that create movement), antagonists (muscles that resist or decelerate movement) and stabilizers. And it’s the same with most mind-numbing exercises I see performed in the gym. You lie or kneel on a bench or stand in a rack and lift a weight with no real purpose other than to move the weight. The absence of true intention places a very low coordinative demand on the movement and the body adapts in an entirely different manner than it would in actual performance of your activity (in this case, throwing or hitting). Strength gains may emerge on that particular exercise, but those gains are not likely to transfer to improved performance on the field. Any time you’re throwing – including throws you make in warm-ups, long toss or weighted ball training –you need to ensure every throw you make is directed at a specific target, just like you would in a game. For example, when our players execute their throwing drills into a “Pitcher Pad” they must “call their shot” by shouting out the number they are attempting to hit prior to the throw. With some of our more advanced students, our instructors will shout the number after the athlete has already begun his motion. This elicits subconscious late adjustments and forces adaptability. And, when you’re lifting weights or performing an exercise, whenever possible, you should make sure the movement or lift has clear goal or target. When we perform our moderate specificity/moderate load power building circuit we require our athletes to guide their movements toward a specific goal. For example, when we perform skaters with a Khaos ball, we place a plyo box on either side of the athlete and ask him to tap the box with the ball on every rep. This approach automatically provides immediate feedback by way of what researchers call objective knowledge of results. This type of training leads to a more intention-based neuromuscular organization that we believe offers better transfer to game performance. Implementing variability and intention-based training into your program requires discipline, forethought, creativity and energy. It can be a nuisance to organize workouts with purposeful targets or goals for every throw and/or exercise and objective measurement and documentation of results can be difficult. Trust me, it’s a lot easier to simply bang out reps without focused goals. However, the reward of accelerated rate of learning, and positive transfer to game performance make it well worth the effort. If you want to experience first-hand the kinds of workouts I’ve just described, I have a few ideas for you. We still have a few opening for our 2017 Ultimate Summer Training Program. Give us a call at 866-STRIKE3 (866-787-4533) and we’ll tell you all about it. Can’t make it for 2 weeks in the summer? Consider a Weekend Elite Performers Boot Camp, or a one day Precision Strike Evaluation and Training Session.